Fast tracking of motion is the key step towards tagged MRI-based quantitative cardiac analysis. Existing motion tracking approaches, including the widely used HARP method, are either time consuming or qualitatively inconsistent, or both. We present in this paper a new fast motion tracking method based on a meshless kernel. For MR image sequences containing multiple image frames, tag intersections are automatically detected in all frames and indexed in the first frame. Then a thin plate spline approach is used to establish a point-to-point correspondence between tag intersections in the initial and the current frame. Lastly, we use a meshless registration kernel to generate a dense displacement map that minimizes the residual of sparse motion at intersections. To further improve the motion tracking, we develop a special technique to preserve tangential angles of tags at tag intersections. We tested our new method on both numerical phantoms and in vivo heart data. The motion tracking results are evaluated against the ground truth and manually drawn tags. Clinical application potential is demonstrated by cardiac strain analysis based on the proposed methodology. 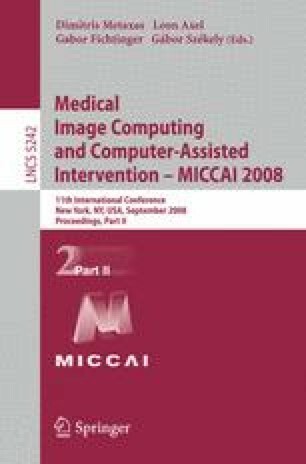 Electronic supplementary material is available for this chapter ( 10.1007/978-3-540-85990-1_38).